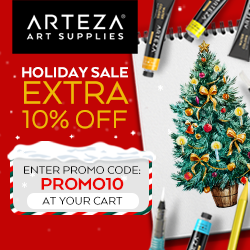 Crackerbox/Suzy Stamps and MISTI Hop and GIVEAWAY! Welcome to the Crackerbox/Suzy Stamps and MISTI Hop! I you’ve come from Martha Lucia Gomez‘s blog you are in the right place. If not head to the start of the hop at the Crackerbox & Suzy Stamps Blog. 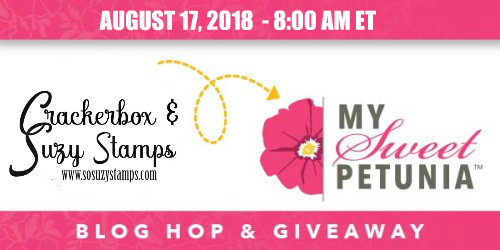 We will be choosing two lucky commenters from the hop to win one of two prizes: a $50 shopping spree at www.mysweetpetunia.com and a $50 shopping spree at www.sosuzystamps.com. Comments will be open until Friday, August 24th, at 11:59 PM Central time & winners will be announced on Tuesday on the Crackerbox/Suzy Stamps and My Sweet Petunia blogs. Jeanne Streiff – you are here! This entry was posted in All Occasion, Crackerbox/So Suzy, MISTI Tool. Bookmark the permalink. Your peeking chick is just too cute. How can anything with coffee be bad? Nicely done! Oh that little bird made me laugh this morning. Thankyou. Love it. These are tooooo cute! The coffee card is the best! Two adorable cards and loved the coffee one especially!! Am always needing more coffee cards for friends! I love your fun cards! That little sparkle on the heart of the coffee cup is the perfect touch! Both cards are very cute … and true! Thanks for sharing. Oh my goodness… that little birdie is adorable. Love the coloring on both of these cards. Cute cards. Nice and . Too cute! I love the peeking card! Great coloring and scene you colored! Both cards are so cute! I really love that sentiment on the first one – cracked me up! Great hop! Such cute cards! The coloring is amazing! Your cards are so cute. The coffee one made me chuckle and I love the happy sun on the bird one. That chick peeking through his legs is so cute! The coffee card is perfect too. Oh Jeanne, what fun. Luv, luv, luv that little peeking bird… made me smile! And the sun has such a fun shine all of its own. 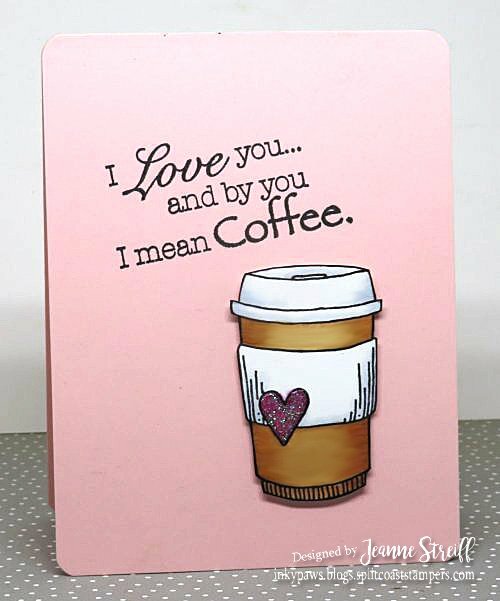 I’m a big coffee fan so your first card really appealed to me too. Love them both! Thanks for inspiring your colouring is awesome. Super cute cards! Love the coffee card! Love that birdie card!! So cute! Such cute cards. Love the coffee cup and the sentiment. both of these cards are so adorable! TFS! Great cards! 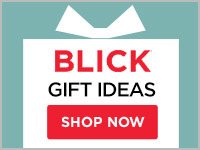 My favorite is the coffee card! TFS! Super fun and sweet cards! Love your clean designs. I’m not a coffee drinker but the coffee card is cute, the “Just peeking in” card is hilarious and so adorable, great job on both! Adorable cards! That Peeking Bird is super cute & put a big smile on my face this morning. Both of these cards crack me up! Love the sentiment on the coffee card and that sweet little bird on the second card is too adorable! 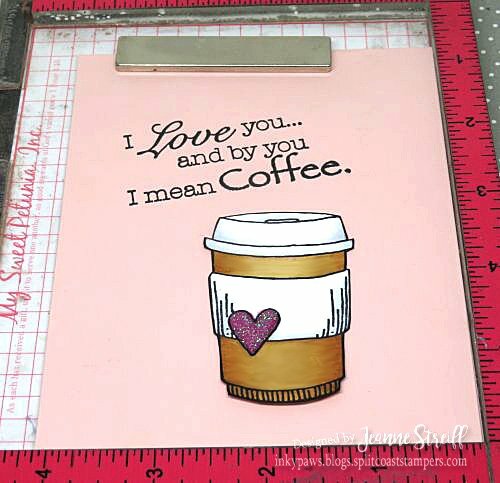 Great coffee card and scene you’ve shared today. 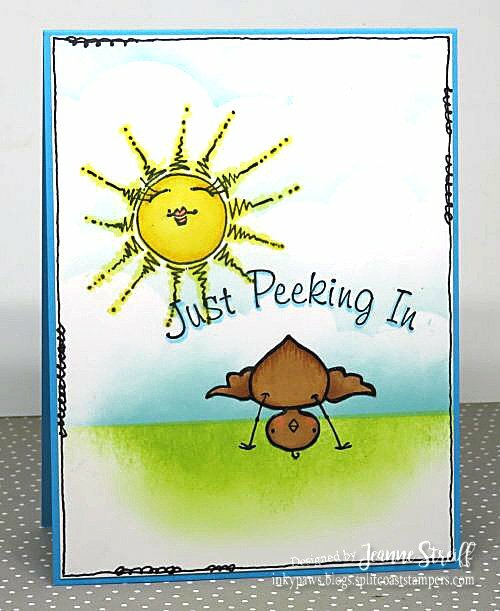 Such cute cards – I love the little bird and sun card especially – and your coloring is just perfect for it! Two great cards! Love the peeking bird! These are really sweet cards! I especially love the first card! Especially being about Coffee! Fun cards! Love that coffee cup and the cute bird! Fun sentiment on the pretty coffee card and love the cute bird on the second. omg, love that chick card! You made a lovely pair of cards ! !